Ken Livingstone visited Mare Street today calling for greater powers for local councils to oppose the opening of new betting shops. Mare Street alone has nine betting shops, whilst Hackney is home to a total 70 such establishments, one of the highest number of any borough in the capital. 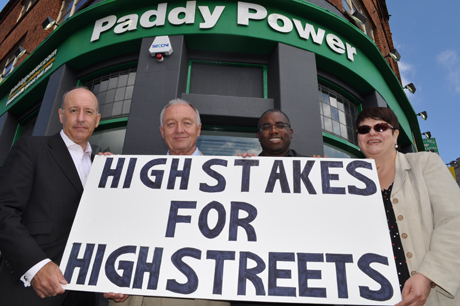 “Local councils should be able to have a say in what’s on offer on their local high street,” said Mr Livingstone in front of the old Railway Tavern pub, which is being turned into a Paddy Power bookmakers. Since the previous government’s Gambling Act of 2005 relaxed licensing laws, betting shops have sprung up all over the capital. There are now around 400 more betting shops in London that there were 10 years ago. “We need to implement laws similar to the special policy area we have for pubs and clubs in Shoreditch, so that no further applications can be approved. We want the powers to be able to stop this,” said Mayor Pipe.